The Roof Rat (Rattus rattus) (AKA Black Rat, Asian black rat, Ship Rat, House Rat, Alexandrine Rat, Old English Rat) is a common long-tailed rodent of the genus Rattus (rats) in the subfamily Murinae (murine rodents). The species originated in tropical Asia and spread through the Near East in Roman times before reaching Europe by the 6th century and spreading with Europeans across the world. Today the Roof Rat is again largely confined to warmer areas, having been supplanted by the Brown Rat (Rattus norvegicus) in cooler regions. In spite of its name, it exhibits several color forms. It is usually black to light brown in color with a lighter underside. A typical rat will be 6 – 8 inches long with another 8 inches of tail. It is nocturnal and omnivorous, with a preference for grains. Compared to the Brown Rat, it is a poor swimmer, but more agile and a better climber, tending even to flee upwards. In a suitable environment it will breed throughout the year, with a female producing three to six litters of up to ten young. Females may regulate their production of offspring during times when food is scarce, throwing as few as only one litter a year. 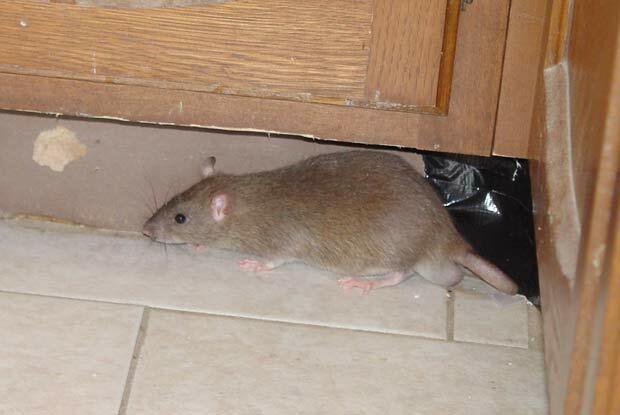 R. rattus lives for about 2–3 years. Social groups of up to 60 can be formed. Rats can chew through wiring, causing fires. Roof rats eat and contaminate food and damage properties by gnawing and burrowing. They spread diseases that affect people and pets.